On May 3, 2014, "The Moment" arrived at the MGM Grand Garden Arena in Las Vegas, Nevada. Floyd "Money" Mayweather fought Marcos "El Chino" Maidana in a welterweight unification bout. Before the Mayweather-Maidana main event, fight fans were treated to a an undercard that featured up and comers and big names. 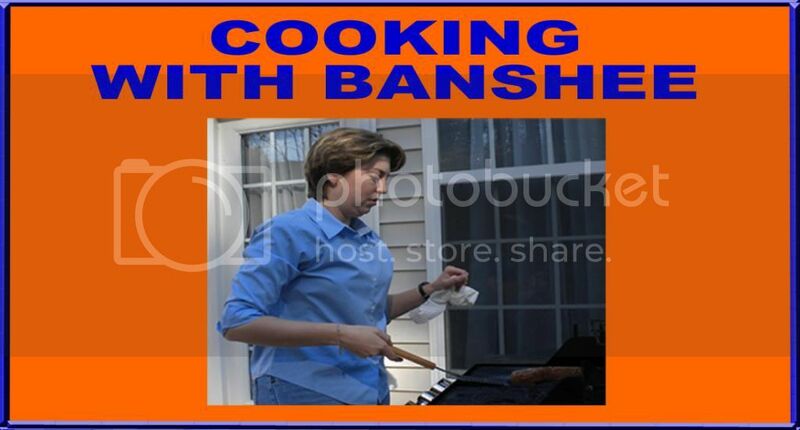 Wild Banshee was one of those fans. This is my first-hand account of the full fight card. J'Leon Love vs. Marco Antonio Periban: A ten-round middleweight matchup between J'Leon Love and Marco Antonio Periban opened the night's action. Fighting out of Mayweather's gym, the undefeated Love got a chance for some big time exposure as the opening act on Floyd's card. When the fight started, the MGM Grand Arena was mostly empty. But, the fans who found their seats early were treated to good boxing action. Periban put a lot of pressure on Love and was able to score the lone knockdown of the fight in the 5th round. However, Love was the more skilled boxer throughout and rallied to land some heavy blows of his own in the later rounds. When the fight ended, the judges declared Love the winner by unanimous decision (95-93, 97-92 and 96-93). That decision did not seem unjust, but, considering the knockdown by Periban, the margin of victory seemed to indicate that Love benefited from some Mayweather momentum in the Las Vegas venue. Adrien Broner vs. Carlos Molina: The second fight on undercard featured Adrien "The Problem" Broner and Carlos Molina in a ten-round junior welterweight matchup. Six months ago, Broner looked to be on the fast track to a title unification fight with Floyd Mayweather. Instead, Marcos Maidana dominated Broner in December, taking both his WBA welterweight title and his lucrative payday. Molina had not fought since he was knocked out by Amir Kahn in 2012. 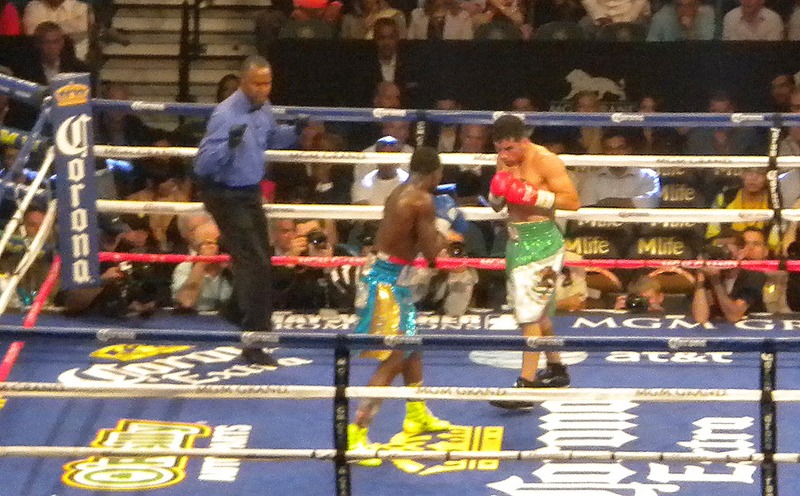 In order to get back on the fast track to a headline PPV fight, Broner needed a convincing and flashy performance. When I left the sports book at the Bilagio, Broner's odds were set at -3000. Broner lived up to those odds with a wide, unanimous decision (100-90, 99-91 and 98-92) against the overmatched Molina. In the ring, after the fight, Broner described the fight as nothing more than a "f-ing glorified sparring match," and that is about the level of interest that Broner showed throughout the fight. Aside from when Broner ground his groin provocatively against Molina's backside at the end of one round, "The Problem" seemed far more interested in his glittery skort and entrance entourage than he was in Molina. Despite the fact that the judge's decision was clearly correct, Broner's victory was greeted by a cascade of boos and whistles. Despite the wide margin of victory, Broner actually did little during the fight to prove his place as one of boxing's true elite talents. The Problem did, however, clinch his place as one of the most hateable men in the sport. Broner's profanity-laced, racially-driven, post-fight rant earned him suspension from the WBC until he issues a public apology. Amir Kahn vs. Luis Collazo: After Adrien Broner lost in December, it appeared that Amir Kahn was next in line to fight Floyd Mayweather. Instead, Mayweather chose Maidana as his next opponent. Therefore, even though no belts were on the line, Kahn had a lot to prove against Luis Collazo in this twelve-round welterweight bout. Kahn was the clear rooting favorite amongst the fans at the MGM Grand, and the Brit put on a boxing clinic right from the opening bell. Kahn bloodied and battered Collazo in the early rounds before dropping Collazo in the third. The fight turned dirty in the middle rounds. In the 8th round, both men had a point deducted, Collazo for low blows and Kahn for excessive holding. Collazo appeared to hurt Kahn with a left hand in the 8th round, but by the 10th round Kahn was back to business. Kahn knocked Collazo down twice in the 10th and seemed on the verge of a knockout when the bell rang to save the woozy Collazo from a third trip to the canvas in the round. Collazo managed to land one more low blow late in the fight that dropped Kahn to the canvas before Kahn cruised to a unanimous decision (119-104, 119-104, 117-106) that was greeted with thunderous applause from the packed house. Floyd Mayweather vs. Marcos Maidana: The action on the undercard was exciting, but there was no mistaking when "The Moment" finally arrived. The atmosphere in the building was electric when the fighters made their ring walks. Marcos "El Chino" Maidana was serenaded by fans chanting the Argentinian version of "Ole, Ole, Ole." Floyd "Money" Mayweather was serenaded by Lil' Wayne, rapping live as he escorted the champ to the ring. 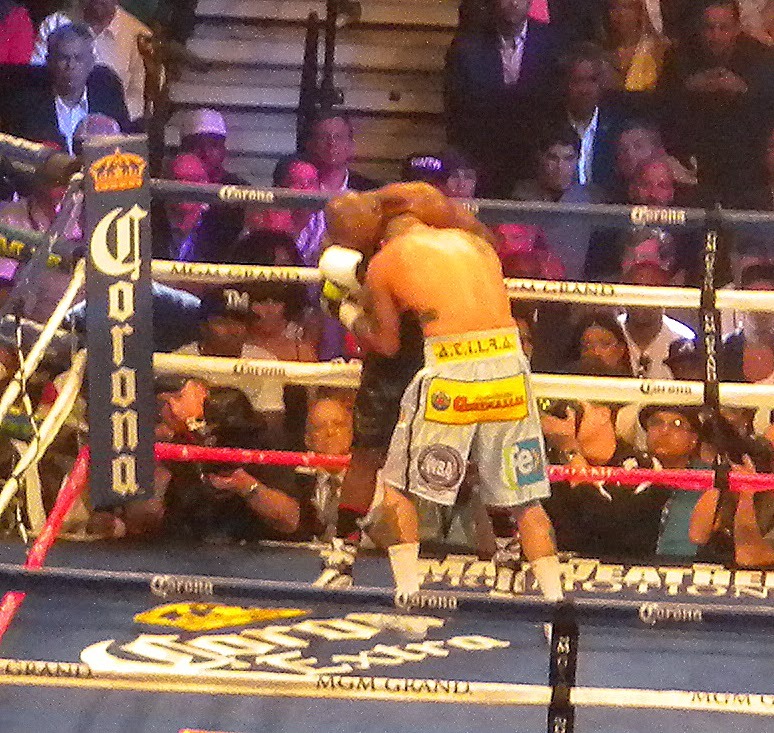 The conventional wisdom heading into the fight was that Floyd Mayweather was the superior boxer but that Maidana did have the power to hurt Mayweather if he was able to land a few well-timed power punches. Maidana evidently knew that as well. Maidana came out of the gates like a tornado. This style delighted the crowd, but in truth, most of the wild, overhand rights that Maidana threw were dodged or turned into glancing blows by Mayweather's masterful defense. 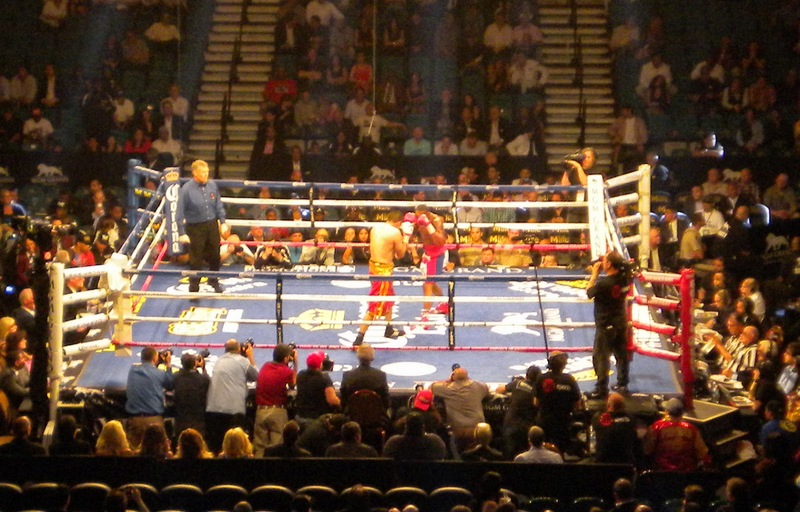 Very few of Maidana's punches landed solidly, and Mayweather never appeared to be hurt. Maidana kept the pressure on Mayweather for the entire fight. Maidana crowded Mayweather throughout the fight, pushing and roughhousing the champ throughout. Maidana threw 858 punches over the course of twelve rounds, but Mayweather showed the Argentinean and the fans at the MGM Grand why he is the best boxer of his generation. Mayweather threw less than half as many punches as Maidana but managed to land about ten more blows, including 178 power punches. When the final bell ended the fight, both men raised their hands in victory. Wild Banshee scored the fight unofficially 116-112 for Mayweather, and the fans in my section agreed with that assessment. However, there was some drama during Jimmy Lennon, Jr.'s announcement of the official decision when the first score was announced as a 114-114 draw. The remaining judges correctly awarded Mayweather a majority decision (117-111, 116-112). Although several news outlets described the decision as "unpopular," I believe that the reaction in the arena had far more to do with the tension of Jimmy Lennon, Jr.'s tease than with the decision itself. Both fighters indicated that they would welcome a rematch. The fans in the arena vociferously approved of the idea. In all reality, however, Mayweather probably already took Maidana's best shot. It's unlikely that the masterful Mayweather would allow a second fight to be nearly this competitive.